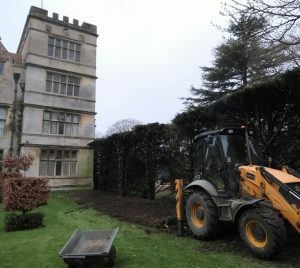 With spring trying its best to arrive, it’s time for our Gardeners to get down to making a start on creating our new Rose Garden to the east of the House. Their inspiration comes from the first plan of the gardens, dated 1604. This plan shows a vast formal parterre to the east of the House, with a smaller parterre enclosed by balustrades immediately against the house. This is where our new Rose Garden will be located. The Parterre Garden existed for roughly one hundred and fifty years, until gardening tastes changed and it was swept away by a more landscaped style of gardening. The balustrades were recycled to create the present stone bridge that spans the canal as it joins the lake. Our new Rose Garden is not going to be an exact replica of what was once there but is designed to return a degree of formality to that part of the garden, a nod to its history. We have a plan of actions that need to be taken as the year progresses. We will bring news of each task as it’s completed. First up, our Gardeners and Estate Maintenance team have set about reducing the thickness of the yew hedge to the north of our new Rose Garden. 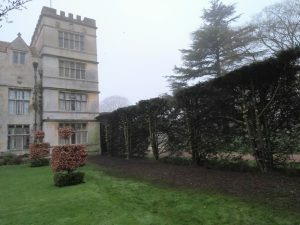 The hedge was too thick and was blocking light entering some of the windows on the North Tower. The hedge was also host to quite a few rogue box and laurel shrubs, giving it a very mix ‘n’ match appearance. The process of reducing the thickness of the hedge appears rather brutal as they cut back all growth on the south side of the hedge right back to the trunks, a couple of meters in all. They also grubbed out the rogue box and laurel. 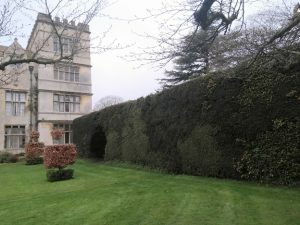 Yew is renowned for its ability to regrow from hard pruning and will certainly recover from the treatment it has received. 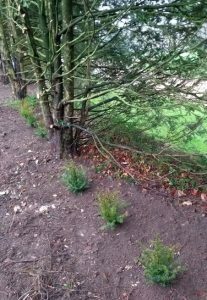 However, to quicken up the process of filling out, they have inter-planted the line of the hedge with new young yew plants. To finish the job off, they graded the bare soil remaining after the onslaught and grass seeded the area. Soon enough, the grass and hedge will be sprouting and the scars inflicted by their work will begin to heal. The next step in the process of creating our new Rose Garden is laying down pathways during the course of the summer. A hard surface will give good access for visitors on foot or in a wheelchair, allowing all our visitors to enjoy the sight and scent on offer. From a practical point of view, a hard surface is easier to maintain as no weeding is required. During the winter our Gardeners will get on with what they call ‘the fun part of the job’, planting roses, hedging plants and under-planting. They will plant bare-rooted roses during the dormant season as they are more cost effective than pot grown roses, but just as quick to establish. There is a lot of work involved in creating our new Rose Garden, but our team have made a good start and the final result will be well worth the effort.